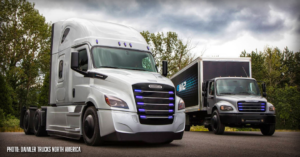 After a sluggish 2018, the electric truck market this year will begin a multiyear run of double-digit increases, a British analyst firm is predicting. The nearly sixfold growth from just under 180,000 units in 2019 to 1.2 million in 2025 will be pushed largely by sales in China. Increased emissions regulations in Asia and Europe also will play a major role, according to the new report by Interact Analysis. Story by John O’Dell / www.trucks.com.